Sunday 20th January marked the conclusion of the Sonubaits winter feeder league at Hallcroft Fishery, Retford. The series, which saw thirty (30) pairs go head to head over a total of five (5) rounds, started on 18th November and continued right the way through the winter period with overall placings being determined by way of cumulative weight. The league was an incredibly close affair with some of the country’s best anglers taking part in an effort to topple defending Champions, former Match This Champion Rob Wootton and partner Joe Carass. 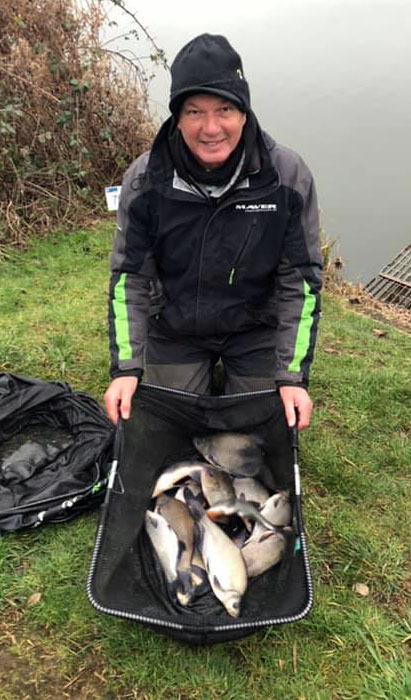 Despite freezing conditions throughout the campaign, Hallcroft provided a perfect platform for the anglers who worked hard to put together some great catches of the resident bream, skimmers and roach. Below, Tommy Pickering looks back on the final round of what was a tough but enjoyable series. “Going into the final round of the Sonubaits winter feeder pairs Mick Vials and me were lying in 5th place, so we needed two good draws to finish the series with“. “I decided to draw for the two of us, putting Mick on peg 44 on Bridge (outer) whilst I was stationed on peg 79 on Moat (outer). Neither pegs are note worthy, but we had at least managed to avoid the really bad areas. My plan was fish two lines; one down the middle at 28m and a shorter line at 13m“. “I started the match on the shorter line feeding positively and started to receive indications early on, which soon developed into nice sized skimmers on the third and fourth put-ins. Despite a reasonable start, as has often been the case on these winter feeder matches, it’s a marathon, not a sprint and patience was key often having to weight extended periods of time in-between bites“. “I opted to fish a bunch of bloodworms on a size 16 hook to 0.12mm MVR line to catch steadily before finishing with a nice flurry during the last hour with four (4) fish coming from the short line. This saw me finish the final match with thirteen (13) skimmers and a lone perch for 13lb 5oz, which was enough to win my lake and finish in second overall“. “Partner Mick Vials managed a section win with 5lb from a bad area, so with a cumulative final round weight of 18lb 6oz, we finished in third place on the day, which moved us up to third place overall! I was chuffed with that taking into account a number of bad draws and not getting my tactics right during the middle part of the series“. “Well done to Frankie and Michael on the overall win. What a fantastic league this is – run brilliantly by Lee Kerry and a massive thanks to Hallcroft and the staff for everything. Also, thank you to Sonubaits for sponsoring the event“.